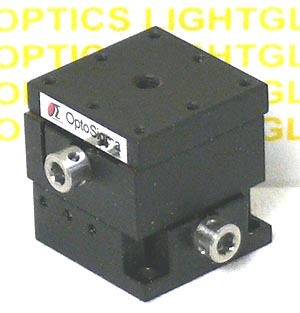 The OptoSigma 123-3340 25mm XY Dovetail Preset Stage has a 25mm square top mounting plate, which is tapped with 8 M2 holes around the stage perimeter and a central hole which is tapped M4. This stage measures 26mm tall, and can be moved 6mm along both the X and Y axes by means of the hex-head actuators. Load Capacity of this stage is 2.50 KG. Constuction of these is primarily blackened brass.